Horse riding holidays in Africa are a once in a lifetime experience to live and breathe wildest Africa from the unique vantage point of a horse. In Northern Africa dry plains and desert stretch out undisturbed, and the countries of Morocco and Jordan fuse African and Eastern cultures. In East Africa Tanzania and Kenya promise savannah and rainforests, with Mount Kilimanjaro as a backdrop. See the white Nile from horseback and raft in Uganda. Explore the wide open beaches of Mozambique on horseback. The wildlife reserves of Southern Africa are unparalleled in their beauty – South Africa, Zimbabwe, Namibia, and Botswana are all excellent big game countries. Africa has the world's largest mixture of wild animal population and diversity, ranging from large predators like lions, hyenas and cheetahs to the more subdued elephants, buffalo and camels roaming freely on open plains. An excursion into an African jungle reveals snakes, monkeys and crocodiles. 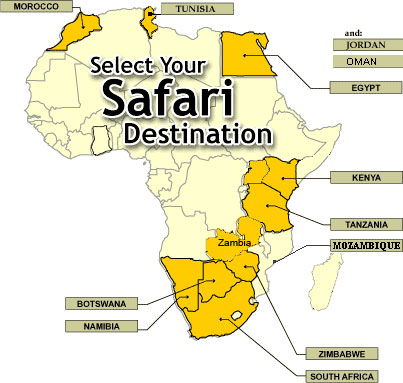 Africa is an exotic, adventurous destination, with opportunities for spectacular horseback safaris. Not only are the surroundings beautiful, but Africa's culture boasts a varied and plentiful wealth of music and dance. After a long day of horseback riding across open deserts or through dense jungles, relax in the birthplace of samba, blues and jazz. These are horseback riding equestrian holidays you will never forget.